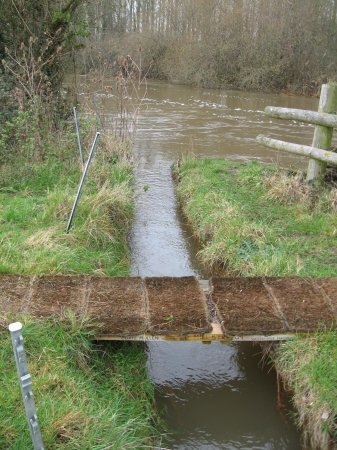 Remarkably wet 30 days, causing 3 slight floods. River rising and filling the Mill stream reservoir. FILL flow, 16 Jan 2008, 0841 hrs, R=356, MS=325. Meeting of the waters. 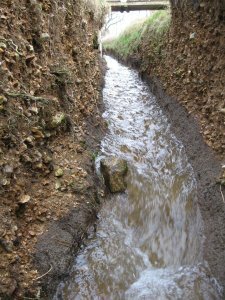 The silt-laden Stour meets the much clearer Mill Stream. 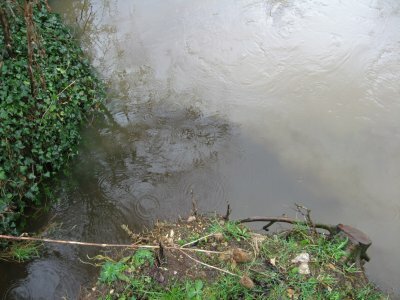 Near balance, with slight flow into the Stour. BALANCE flow, 29 Nov 2009, 1150 hrs, R=292, MS=293. River falling and Mill stream reservoir draining back into it. 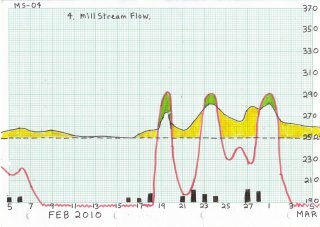 DRAIN flow, 18 Jan 2008, 1549 hrs, R=267, MS=308. From Post 01, otter stone, river. From Post 01, otter stone, bridge. The River >250 and >the Mill Stream, producing FILL flow. The Mill Stream >250 and >the River, producing DRAIN flow. The rate of flow is proportional to the difference in levels. 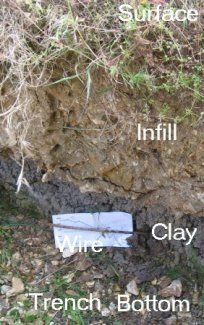 When flow occurs but levels are equal, an interesting oscillation occurs along the trench, triggered by small level changes in the fast-flowing river. 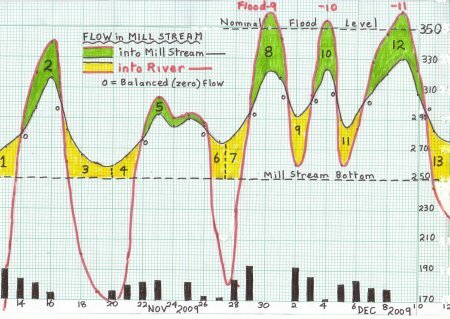 Flow will usually occur during the winter, when river and Mill Stream levels are often high enough. 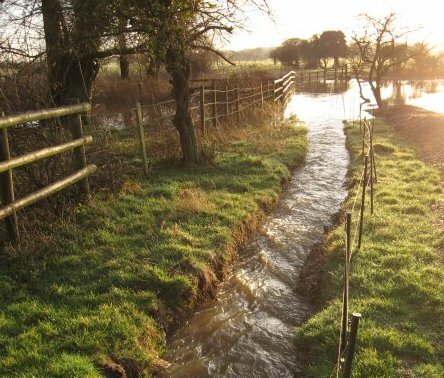 However 5 July 2007 would have produced a good FILL flow, due to country-wide rainfall that flooded much of middle England. 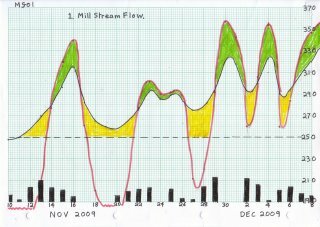 FILL flow has the advantage of speeding storage of river water in the Mill Stream reservoir when the river approaches flooding. 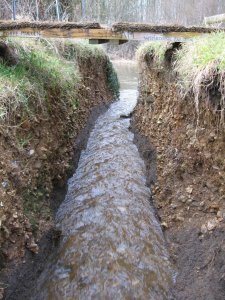 DRAIN flow assists drainage from the Mill Stream reservoir when flooding is over. 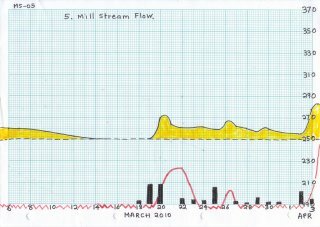 The Mill Stream is unusual in that there are four inflowing brooks for rainwater collected in nearby hills, and two outflow points which only work for levels above 300. 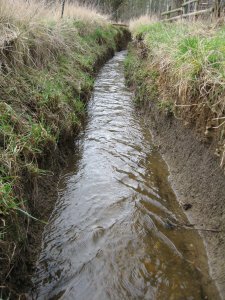 As a result the Mill Stream was usually stagnant. 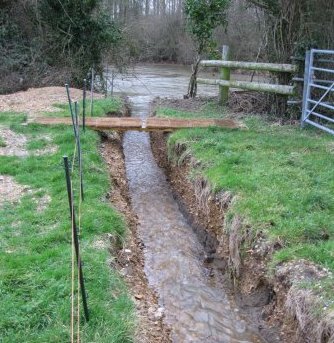 The tidal trench now allows heavy rainfall to find its way to the river at a level of 250, as is evident from clear water flowing into the silted river at the North end of the trench. 4 Hump lowered to  ? The trench has now become a highway for wildlife. 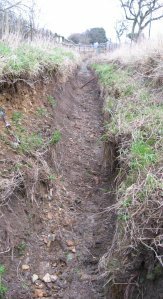 of the trench, about 3 metres from the river. 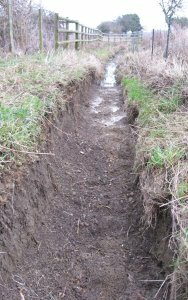 on the silt delta where the trench meets the river. 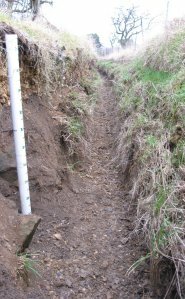 Looking North, R=350, depth=1 metre. Looking South, R=343, depth=93 cm. 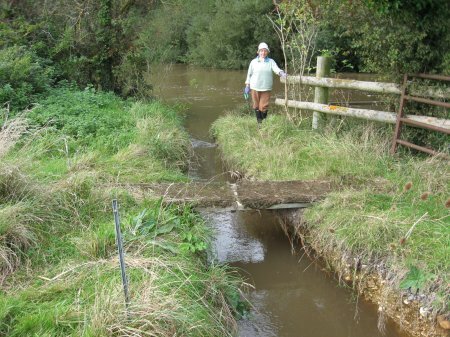 7 Oct 2012 Stour flows into Mill Stream. 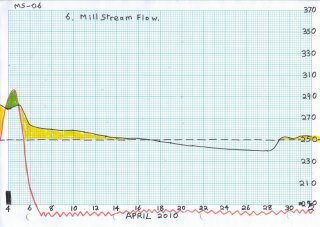 7 Oct 2012 Flow continues down Mill Stream. 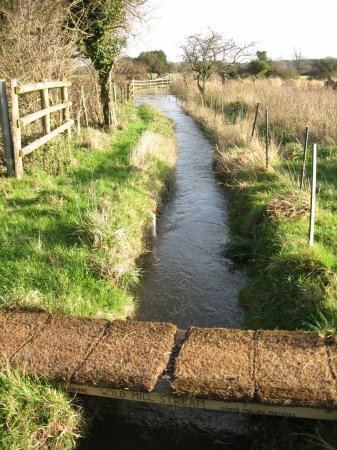 Two-directional "tidal" flow in the Old Mill Stream. 250 produce two-directional "tidal" flows shown in the graph. 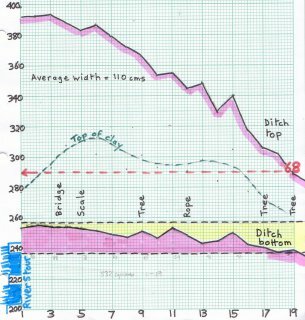 the exponential decay of MS.
12 Continued heavy rain pushes river into flood. and MS to drain into it. about 280 and MS at 250.
other streams are approximately equal. MS from rising above about 320. See photos 62f, 62k, 62m, 62j. 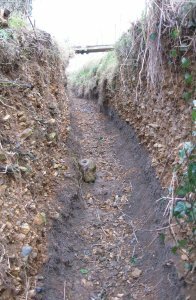 Lengthwise profile along 68 metres of ditch. 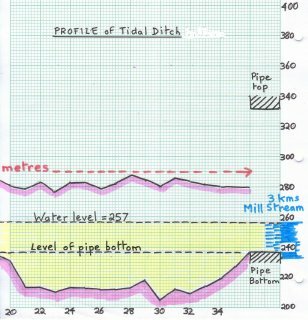 Pipe bottom defines lowest effective level. 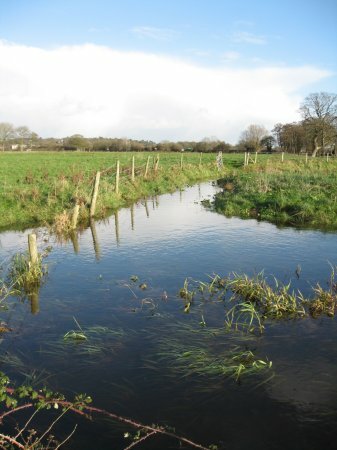 119 acres of meadow and pasture on the Stour floodplain. 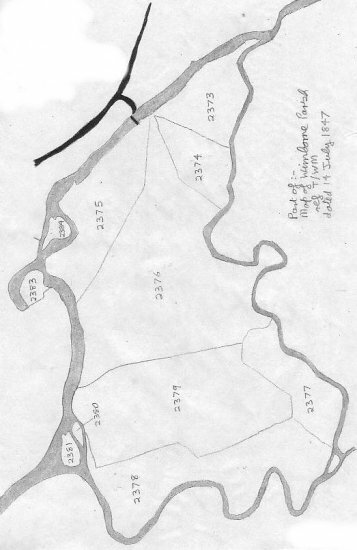 2380-2381-2383-2384 were islands in 1847, today they have "grafted"
onto the nearest bank, possibly part of the canalisation exercise on the River. oxbow, show the water in the minor loop once had a sturdy flow. 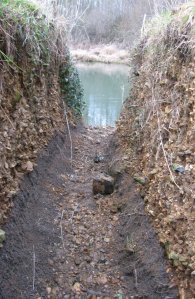 silted up, but a direct channel now exists. OS reference 9955-9912 where there is now a low earth platform. 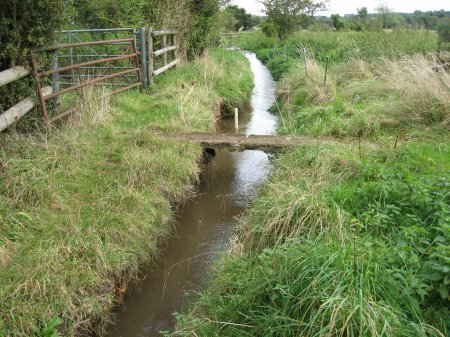 as a ford or possibly a bridge where the present wooden footbridge is. freezing and brought on an early crop of grass."